The Little Giants (3-0) used a game-opening 18-play scoring drive to set the tone for Homecoming 2005, posting a 50-2 NCAC win over Earlham College (1-3). "We had a lot of penalties the whole game (10-85) and that’s not what we want," Harbaugh said. "Some teams would get that many penalties and not be able to score. That was a good drive but we don’t want penalties like that." Harbaugh, who has thrown 9 touchdown passes in three games and hit on 21 of 28 passes Saturday, helped make plenty of Homecoming heroes hitting Mike Russell and Graham Nelson for scores. Brandon Roop ’06 scored two rushing TDs for the Little Giants. "I was just following the big guys up front," Roop said. "They always stay on their man and make huge holes and I couldn’t help it but to walk through and end into the end zone." As the Little Giants built the big lead, Coach Chris Creighton freely substituted in the second half. "This was a fund day for us for sure," Creighton said. "But you want to do it right with the other team; you want to try to play as many guys as you can. These games are always fun but sometimes they’re frustrating as well." The Wabash rushing game totaled 148 yards to go with Harbaugh’s 262. Dustin Huff threw for 32 yards in the final quarter. Chris Ogden ran for 66 yards; Don Juan Brown rushed for 54. Shane Keffer scored a rushing touchdown in the fourth quarter to complement Roop’s two TDs. Adrian Pynenberg led the Little Giant defense with 7 tackles. Aaron Selby and Jared Lange each added 6. 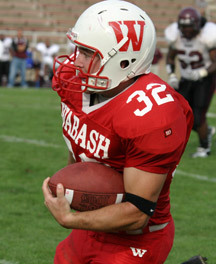 Thomas Bell contributed five stops for the Wabash defense which has yielded just 15 points through three games. "We’re playing all right. We’re not making big mistakes," Harbaugh said of the 3-0 start. "We are making a lot of penalties that will hurt as when we get into the heart of our schedule. We’re not turning the ball over and we’re moving the ball really well. That speaks a lot to our line and the great receivers we have. That makes it all really easy." Wabash travels to Ohio Wesleyan Saturday. Top left: Eric Summers hauls in the pass for a touchdown on the game's opening drive. At right: Chris Ogden finds daylight against the Earlham defense. On Homepage: Brandon Roop scores one of his two touchdowns. On Student Homepage: Geoff Walker breaks free toward the endzone but was ruled out at the one-yard line.